An image of the sun taken in 1997 shows the hot temperatures of the corona (in lighter colors) compared to cooler temperatures of the surface of the sun (in darker colors). If you think a sunny day here on Earth gets toasty, imagine how much hotter it would be if you were flying through the upper layers of the sun's atmosphere. The answer is a whole lot hotter, in the millions of degrees whether measured in Fahrenheit or Celsius, according to NASA. And that incredibly hot upper atmosphere is exactly where a new NASA spacecraft will head after its launch later this week. But even the hot side of the heat shield won't actually hit millions of degrees itself, despite flying through the hottest part of the sun. "Think of putting your oven on and you set it at 400 degrees, and you can put your hand inside your oven and you won't get burned unless you actually touch a surface," Parker Solar Probe project scientist Nicola Fox, a solar scientist at Johns Hopkins University, said on July 20 during a NASA news conference about the upcoming mission. "It really is the same." 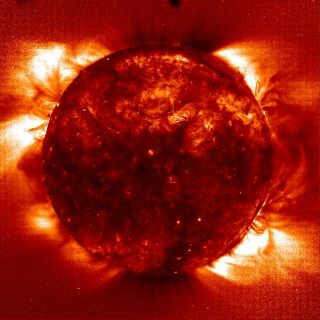 The more bearable temperature is thanks to the thin, wispy structure of the corona itself, which is the atmosphere that can't be seen without blocking out the photosphere — the incredibly bright layer that we think of as the surface of the sun. That means, over a set amount of time, the heat shield won't hit all that many superhot particles of the plasma that makes up the corona — which means that although each individual collision transfers a fair amount of heat to the shield's surface, the overall increase in the shield's temperature will be tolerable. "The corona is very tenuous plasma; it is not a hugely dense area," Fox said. "So, if you think about the amount of particles that actually are striking the heat shield and depositing that heat in, the whole thing gets heated up to 2,500 degrees Fahrenheit [1,370 degrees C]." That's a much more manageable temperature for the heat shield to withstand — the equivalent of putting your hands inside the oven without touching any surface. "Like I would just say, 'Don't touch the oven surface,' don't touch the 3-million-degree plasma," Fox said. And the Parker Solar Probe will be heeding that advice, merely flying through the corona without hitting dense concentrations of plasma.